By implementing the shared vision presented in this plan, New Jersey can make higher education in the state more affordable and accessible for all residents. An opportunity to gain knowledge. An opportunity to preview and select a career. An opportunity to improve future earnings and contribute to the economy. In order to support lasting economic growth across the state, every resident of New Jersey needs to have access to this critical opportunity. New Jersey offers a bold new vision for higher education in the state through a Student Bill of Rights. Every student in New Jersey should have the opportunity to explore college options and career paths during their middle and high school years. Every student in New Jersey deserves to receive clear and comprehensible information explaining what college will actually cost for them and their families, including an explanation of the types of aid available, an estimate of likely loan debt, and information on postgraduate outcomes—such as earnings and job placement. Every student in New Jersey should have access to an affordable route to a college degree with predictable tuition and fees, and support to help with non-tuition expenses. Every student in New Jersey should have the opportunity to work with an employer, conduct meaningful research supervised by a faculty member, or access some other form of experiential learning before graduation. Every student in New Jersey should have access to faculty and staff who have the ability, time, and resources necessary to support student learning and development. Every student in New Jersey should have the financial, academic, and social support needed to complete college as promptly as possible with a degree or credential. Every student in New Jersey should have the opportunity to demonstrate that credentials and work experiences obtained outside a college classroom are worthy of being awarded college credit. Every student in New Jersey should have high-quality, career-relevant academic programs that will prepare them to succeed in the global economy. Every student in New Jersey should feel safe and supported in their learning environment. This means colleges must work to ensure students are not only safe from physical harm, but also included and welcome on campus. Every student in New Jersey should be included in decision-making processes that affect them, whether it be on campus or statewide. Cultivating research, innovation, and talent to deepen and recapture our role as a leader in the innovation economy and effectively prepare students for success after college. Taking these coordinated steps now will help transform higher education in the state. 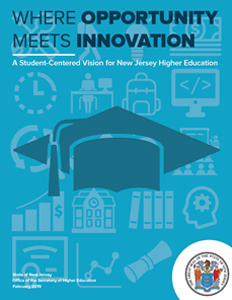 Be a part of the student-centered vision for higher education in New Jersey. Stay tuned for ways to participate and make your voice heard.